While not all Israelis support Netanyahu, most share his fundamental foreign policy concerns. For the majority of Israelis, Netanyahu still represents a reassuring voice. Moreover, Netanyahu has always argued for a demilitarized Palestinian state. His recent statement was not a policy departure about the kind of neighbor Israel seeks. Critics have concluded that Netanyahu's pre-election comments abandoned the two-state solution proposed in his 2009 speech at Bar-Ilan University, but a closer look reveals more about animosity towards Netanyahu. Diplomatically, the two-state solution is still the basis for Israeli-Palestinian negotiations. Diplomatically, the two-state solution is still the basis for Israeli-Palestinian negotiations, as advocated by most of the international community, spearheaded by Washington. Reaching it is the official policy of both the government of Israel and the Palestinian Authority, but it is no secret that Hamas does not support this notion, with or without PA President Mahmoud Abbas. In the heyday of the Oslo peace process, the push for an Israeli-Palestinian agreement was done on every possible level, socially, politically and militarily, and even reached a point where being "anti-Oslo" connoted being anti-Israel. But 20 years of bitter experiences later, Oslo has lost its allure and has been replaced by a more skeptical prism of the region. The essence of my Jewish consciousness, and of my belief in the eternal and unimpeachable right of the people of Israel to the Land of Israel. However, I say this here also to emphasize the immensity of the pain I feel deep in my heart at the recognition that we have to make concessions for the sake of peace between us and our Palestinian neighbors. The right of the Jewish people to the Land of Israel does not mean disregarding the rights of others in the land. The Palestinians will always be our neighbors. We respect them, and have no aspirations to rule over them. They are also entitled to freedom and to a national, sovereign existence in a state of their own. I am among those who believe that it is possible to reach a fair compromise and coexistence in good neighborly relations between Jews and Arabs. However, I must emphasize one fact: There will be no compromise on the right of the State of Israel to exist as a Jewish state, with defensible borders, in full security and without threats and terrorism. 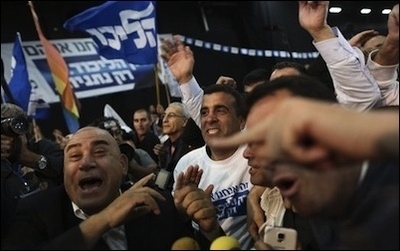 Israelis have not lost hope in peace, but they are more prudent about the process. Netanyahu still underscores that "just as Israel is prepared to recognize a Palestinian state, the Palestinians must be prepared to recognize a Jewish state."